The Gadget: Blazewear's heated vest is powered by a lithium ion pack and good for hours of user controlled heat. It also has a built in flashlight on the battery. It's very warm! The Verdict: OMG warm! Although not as fitted or high quality as the Ardica jackets, which have padded battery packs and clothing designed by people who specialize in fashion like Mountain Hardware, Blazewear isn't meant for the same purpose, and is a lot more affordable. And very warm, as I said! Wearing a thermal I took some heat gun ratings of my core and the vest at settings 1 through 5. Setting 1 is very toasty, and lasts about 3-5 hours, with 5 lasting far less than that. Here are the ratings and my level of comfort. Setting 3: Vest temperature of 130, skin temperature at my chest of 95. Slightly sweaty, body trying to cool itself. Setting 5: Vest temperature of 150, skin temperature at my chest of 99. Uncomfortably warm. I took these measurements at room temperature, after 15 minutes on each setting, but you could feel the heat changes within seconds. The higher settings seem unnecessary but in cold environments, I'd be glad to have them. The extra heat also works to penetrate thicker clothing, too, like shirts and sweaters. The vest's three heat panels are on the back (a large rectangle) and on the flank of the zipper on the front (two smaller strips). The heat was sometimes spotty, on account of the fit being not exactly snug. In fact, the vest's fit is a little on the big side, so good for larger Americans. And the synthetic materials seemed to breath well. When the vest was off, it offered little or no additional warming, fwiw, so you won't want to depend on this jacket when its powered down. 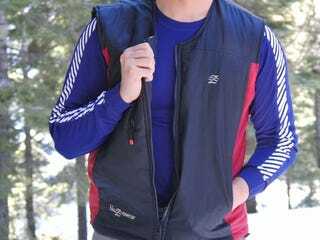 Although Blazewear has outerjackets and gloves, I tested this one because it seemed to be the most capable of being used with your existing jackets and clothing, which you've probably chosen because they also look nice. The vest is meant for sporting, but I declined to use it for snowboarding simply because of two reasons: the battery pack rests on my hip, and would be very painful to fall on, and although it would be nice to adjust the vest's heat output electronically as I went from the chair to moving, the control are on the battery, which is in a pocket and inaccessible. I wouldn't be willing to unzip and reach inside two layers and a pocket to do so. If I was going for an outdoor activity jacket, I'd get an Ardica, but I'd have to spend a lot more money, too. The cost, though, is very reasonable. And I've fallen asleep wearing it on cold days on the couch, wearing only it and no blanket. For those who are cold and want unbeatable warmth that is electronically generated, I'd recommend this vest for those on a tighter budget who want to wear it while commuting or hanging around. Snowmodo is our snow sport winter meet up at Lake Tahoe, with prizes, discounts, tons of fun snow activities, a party and GADGETS. If you can make it (and people are coming from TEXAS) please RSVP and find out more info by clicking on the banner below. I'll let you wear my hat (below).